Crush the garlic, rosemary and parsley. Add lemon zest and combine with 2 tablespoons of olive oil, 1 tablespoons honey and 1 vinegar, and spread all over the meat like a rub. Let marinate in the refrigerator for 1 hour or overnight. Place on a baking dish and cook for 45 minutes or until browned. Cut potatoes in half, place on a separate baking dish, add 1/4 cup olive oil, salt, pepper and rosemary, and bake. If you’d like, you can bake the potatoes in the same dish as the rack of lamb, I did them separately so each dish can retain its individual flavor. You can also use this recipe with pork chops, loin or leg. 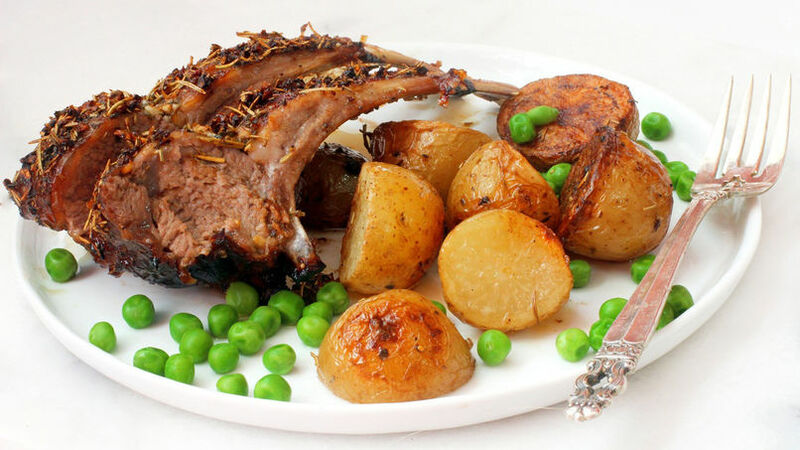 Lamb is one of my favorite Sunday lunch meals. I usually serve it with a side of roasted potatoes with rosemary and garlic. Its delicious aroma fills my kitchen. Try this recipe!